For the past several years our youngest son Jeremy has made a point to visit his grandmother, my mother, every other Tuesday when he makes the drive from Louisiana to check his sales accounts in the Hattiesburg area. This past week he made a trip on Tuesday and again on Thursday, the second time with wife Katie, 3-year-old Molly Kate and 17-month-old Walker joining him. Husband Walter and I are so blessed that both our mothers have been a loving part of our children's and grandchildren's lives. 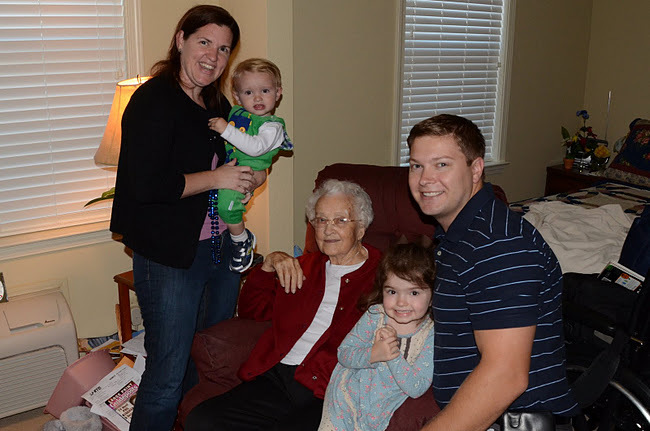 My mother surrounded by our daughter-in-law Katie, Walker, Molly Kate and our youngest son Jeremy. I borrowed this photo by Jeremy from Katie's blog, The Daily Skup. I love any chance I get to see precious Molly Kate, I must admit that she has been my favorite of your family members! Great picture of a beautiful family. a beautiful family and you are truly blessed to have your parents around for your children. Great photo! I know great-grandma loved visiting with those precious little ones--who are growing like weeds, by the way! This is what I envy: a real family. How lovely. Everyone looks so happy. Delightful family. I love when family can be close enough to visit. We celebrated our granddaughter's 17th birthday last night. We went out to dinner and a art performance, all were her choices. Lots of fun and so wonderful to share the time together.